Growing up, apple picking always seemed to be the thing to do when the weather started to get that chill in the air every time the wind blew. I have pretty vivid memories of sticking my feet into the freezing cold mountain water in the little streams and creeks near The Peaks of Otter. It’s something I still get the itch to go do every time the weather begins to turn, and it just doesn’t feel like Fall has begun until you’ve wound your way through an apple orchard, grabbing at ripe fruit and eating it straight off the tree – tree germs and all. We decided last weekend to head up to a local orchard to do some pickin’ and found that we had quite a few within an hour of us! Decisions, decisions… We were planning to head somewhere close by when this Groupon magically appeared in my inbox the day before for a Hard Cider tasting at an orchard just north of us. I mean, if that’s a not a sign…? I’m all about multi-tasking. 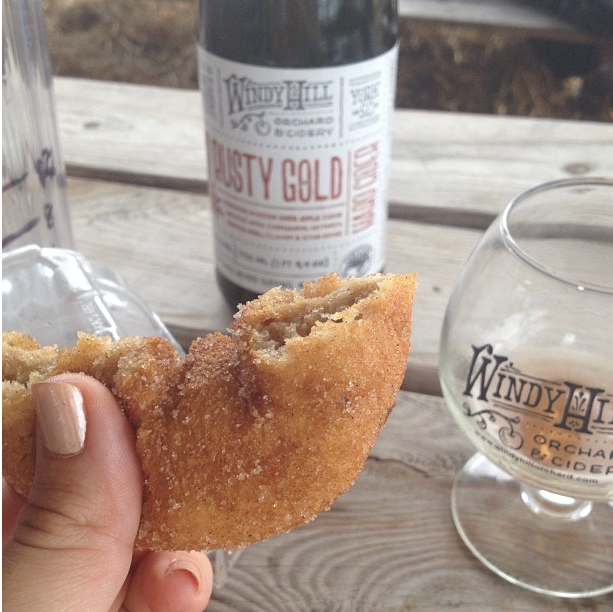 If I can go somewhere, get my apples for my apple butter, AND participate in a beer tasting? Well, sure. This girl is an easy sell! Flights are only $5 and they let you taste all 6 flavors! Definitely the way to go. Please take me back to this moment. Not being huge fans of hard cider normally, we were really pleased and surprised with their ciders! We liked all of them, preferring some more than others, and even came home with two bottles! I don’t think this is going to be our only Windy Hill excursion, that’s for sure. Oh, also…..CIDER. DOUGHNUTS. I don’t even know what to say besides heavenly, airy, life-changing, cinnamony goodness. *sigh* Can I have another dozen? If you’ve never made apple butter, I highly recommend you give it a shot! If you’re not into canning, you can keep it in an airtight container in the fridge for about two weeks. It makes great gifts, and I’ve even seen a few suggestions for recipes using apple butter if you find yourself with a surplus. But that’s like saying you’re surrounded by too many rainbows or you’ve been given too much bacon – it’s basically impossible. If you do want to try your hand at canning, this is a great place to start. It’s really easy to make so you can save your stressing out for the canning process instead of trying to perfect what’s going into the jars. The acid in the apples and the lemon juice make it perfect for water bath canning. I processed my jars for about 15 minutes, but it’s best to follow proper guidelines before doing it yourself. My spin on a traditional apple butter includes bourbon and vanilla in addition to the regular spices. The bourbon flavor isn’t very strong, so don’t be afraid if you’re not normally a bourbon drinker! You can also leave it out, and it won’t affect the recipe one bit (but, for the record, I’m not recommending that – bourbon makes most things better). BOURBON VANILLA APPLE BUTTER – A Milk Truck Original! 1 – Combine apples and apple cider (or water) in a large stock pot or dutch oven over medium heat. Bring to a simmer and cook until apples are soft – about 15-20 minutes. If you partially cover them, they will soften faster. 2 – Using your handy immersion blender that you’ve now purchased because it’s only thirty bucks and totally worth it, blend your apples into a puree. Voila! You now have applesauce! NOTE: Now is the time to taste it so you can decide how much sugar you want to add later. Some people don’t add any, and some people add up to 2-1/2 cups (whaaat!?! ), but I try to stay somewhere in between. I like to maintain the apple flavor and natural sweetness, if I can. 3 – Now comes the part that requires some time and some patience – you’re going to turn your applesauce into Apple Butter! Add in your sugar, bourbon and all of your spices. Juice your lemon into the mixture. Scrape out the caviar from the vanilla bean and add that in as well. Then just throw that whole vanilla bean in there! Give it all a stir and bring it back up to simmer (there should be one or two bubbles every few seconds). Reduce your heat to medium-low and cook uncovered until the mixture has reduced and thickened to your desired consistency. Stir it often so that it doesn’t burn on the bottom. This could take anywhere from 1-2 hours. It will look and sound a bit like lava and start to darken in color. That’s the best way I know to explain it! But y’all are smart…you’ll know. I like my apple butter a little softer and “runnier”, not far from the consistency of applesauce, but some people like it thicker. It’s really up to you! It’s great on biscuits & toast either way. 🙂 Just be sure you cook it long enough to merge all those delicious Fall flavors! 4 – Remove that Vanilla bean! (You thought I forgot about that, didn’t you?) Remove the apple butter from heat. If you’re NOT canning, let the Apple Butter cool and then transfer into an airtight container and store in the refrigerator for about 2 weeks. If you ARE canning, pour the HOT Apple Butter into your sterilized jars and continue with the water bath canning method. Serve on hot biscuits, on toast, or stirred into oatmeal and enjoy your taste of Fall! 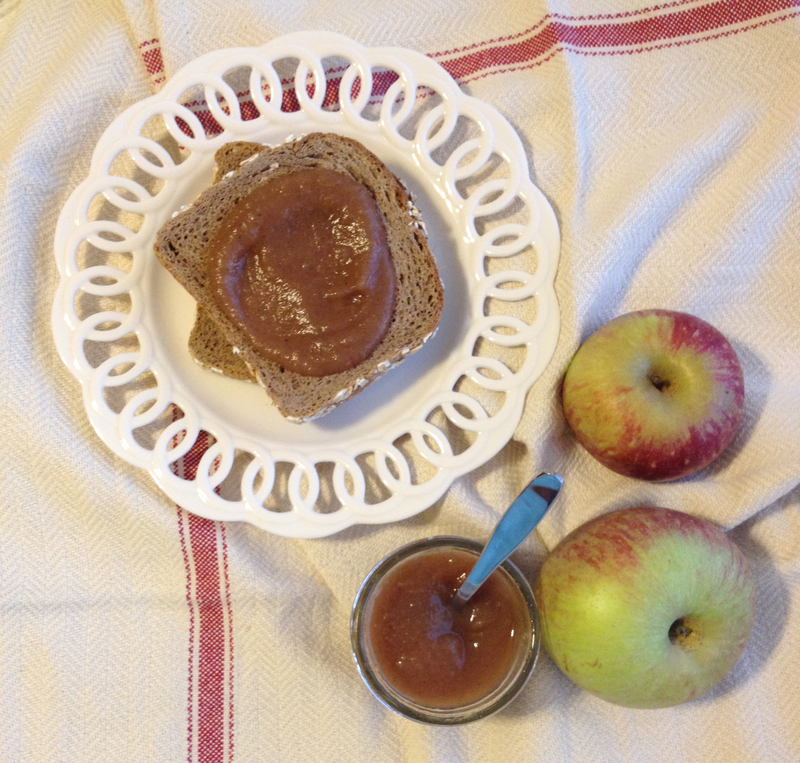 The beauty of Apple Butter is how easy and versatile the recipe is. Once you have the basics down, you can test out any flavors or tweaks you want. Some people leave the peel on, some people prefer to peel the apples first (I’ve heard it’s more nutritious to leave them on). 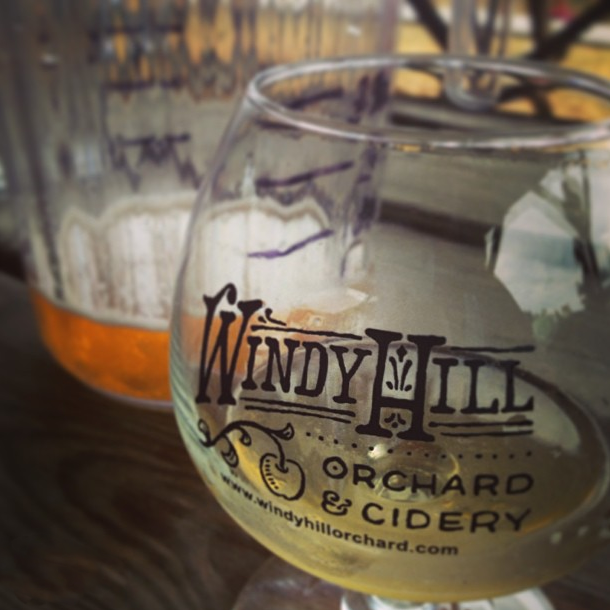 Some people don’t add any liquid to the mixture, while others prefer cider over water, or water over cider. You can add more cinnamon or less cinnamon; go naked (no sugar) add bourbon or amaretto. When I first made this I was just really feelin’ the bourbon/vanilla mixture and, honestly, I haven’t looked back since. But you can leave those ingredients out for more true apple flavor. Make it your own! I only used half my apples, so I’ll be canning some more this weekend too, Reggie! I might try it in the crockpot this time. About how long do you leave it? We had so much fun at Peaks of Otter in Those days. Hope you remember those days!